As I look out my window, it is hard to believe it is still winter. 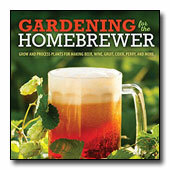 Seeing the sunny, clear skies, I wish I was out gardening or hiking, or just about anything outside. Sunny weather and temperatures in the high 50’s in Portland, Oregon last Sunday had everybody thinking spring, but just two days later I woke up to a brief smattering of snow. 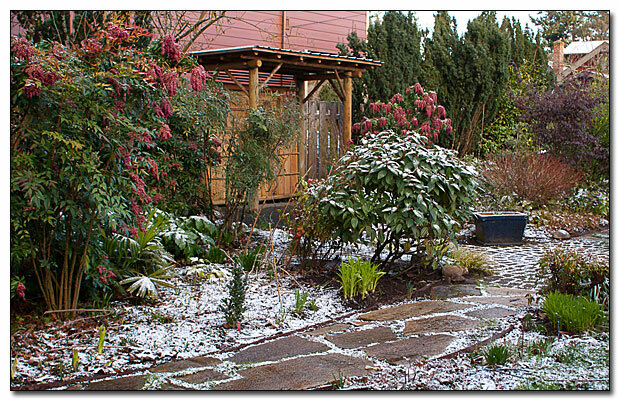 Here’s my garden with just a light dusting snow, taken early Tuesday morning. 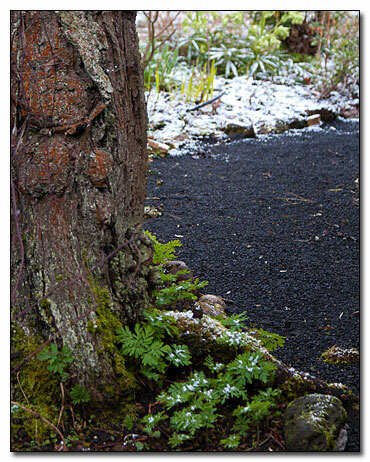 Oddly, the snow is small, icy pellets, fitting perfectly into all the crevices of the paths. Just look at the middle picture. 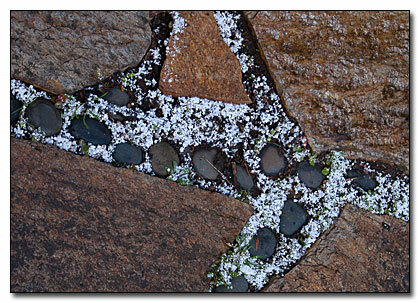 It is as if I placed each little snow pellet around each little pebble in the path. Of course, I did not do that, and of course, I could never get them aligned nearly as well as Mother Nature. Isn’t nature amazing? The calendar says we have less than two more weeks, with the spring equinox on March 20th. We all know that spring never really arrives right on schedule. Current temperatures in Portland are a tad cool at 50 degrees Fahrenheit. The average for this date is 54. Pretty close. The highest temperature on record is 69 set in 2001. The lowest record of 25 was set in 1974. So maybe we will have an average spring, arriving sometime in the next few weeks. Right on schedule?